Without Walls is a consortium of festivals and arts organisations that brings together artists, promoters and commissioners to make high-quality multi-arts outdoor shows – from the intimate to the epic – that tour to festivals across the UK and beyond. Established in 2007 as a partnership of five founding festivals, Without Walls has quickly evolved; from these five partners to two core networks, spanning 18 festivals, to 36 partners spanning three strategic groups. Without Walls nurtures talent and skills by researching, developing, supporting and touring new work, enhancing the growth of the sector, and reaching large audiences, many new to the arts. Over the last 10 years Without Walls has supported over 120 new shows. These have been made by artists that have been working at the heart of the outdoor arts sector for many years, and those new to working outdoors. Without Walls encourages artists to explore new ideas in a positive, supportive environment. Without Walls champions and supports diverse work, with shows made by BAME artists and Deaf and Disabled artists. Many shows continue to tour nationally and internationally, contributing to the UK’s recognition as one of the leading countries for outdoor arts in Europe. Over 3 million people have attended Without Walls consortium festivals over the past three years. 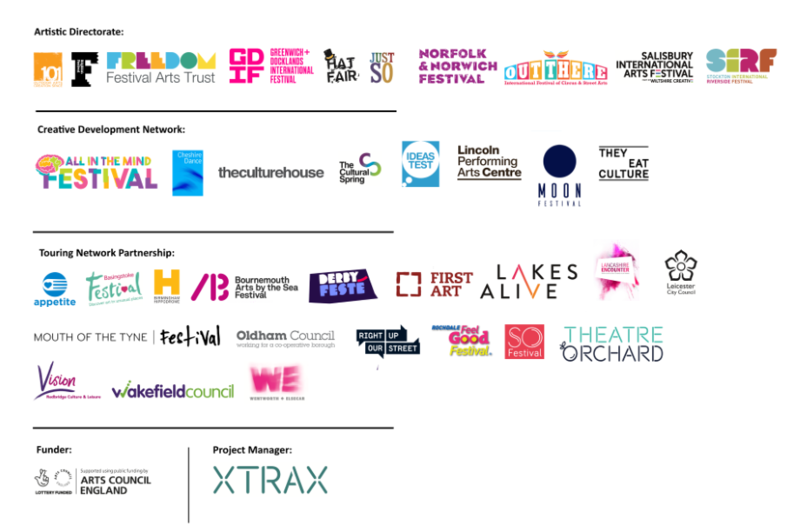 Without Walls partners represent the diversity of the outdoor arts festival sector; from the metropolitan centre of London to the banks of the River Tees in Stockton; from the woodland site of Just So to urban public spaces in Stoke, Doncaster and Skegness. Over the last decade Without Walls’ work has been underpinned by project funding from Arts Council England’s Grants for the Arts programme, and more recently from its Strategic Touring Programme. Without Walls is funded by Arts Council England as a National Portfolio Organisation.